He has left and joined the great ones at Their Feet. Many of you will have read the reverent homage of Shraddhavan which includes some historical facts about Arindam. This tribute, therefore, contains some of my personal reminiscences of a yogi who for me, stands alongside Nolini, on a high plateau of the Integral Yoga. More than fifty years have passed since first we met in the U.S. and I, a callow youth, sat spellbound hearing his inspiring and illuminating words. He usually began his talks with the words, ‘Dear Children of the Mother’ and when he spoke, although he called himself a philosopher, one felt the Presence of the Mother and Sri Aurobindo physically in the room. In later years the Presence was so concrete that one felt, as Arabinda would say, as if the Peace, came down like a solid block of ice, but warm and all engulfing. There are some whom Mother assigns to be a guide to bring one closer to Her. She did this often with people in the Ashram and Arabinda and Nolini were the ones entrusted to bring me nearer to Her Feet. Through more than fifty years his guidance, inner and outer, and his sharing of the deepest understanding of the Integral Yoga has been a base and support in my sadhana. I remember a meeting in Sedona, Arizona in the early 1960’s when he shared things so confidential that I have never shared them with anyone. These were pivotal points for me in the integral yoga and though I was only twenty-three, they were of inestimable help in my inner growth. There are some other experiences that I can speak of in this homage now that all these years have passed. As the years passed I felt his love for me increasing more and more, if that could be possible. He spoke to me intimately of the early ‘Church fathers’ and their ‘Prayers of the Heart’ but most especially of Mother and recently of Sri Aurobindo. One evening he showed me a letter from Mother which I hope will be preserved along with his many letters from Mother and Sri Aurobindo and disciples which will be for all of us rare and sacred treasures. He had written to Mother saying that when he gave talks it seemed that the words were those of Sri Aurobindo. Too many years have passed for me to remember the exact reply from Mother but paraphrasing as best I can, She replied that the closer he became to Sri Aurobindo the more He would speak through him. His journal Gavesana was very dear to him and he honored me by asking if he could publish some of my poems. Once he said, “You know, the flower on the front is Power Aspiring to Become an Instrument for the Divine Work, Power!” He occasionally asked me to write to special friends in the U.S., theologians and others who had offered him prestigious positions at Universities and invited him to come to the U.S. to give lectures. From time to time would dictate letters for me to type and send to colleagues abroad. One such letter was to Donald Goergen OP, with whom I have had the opportunity to correspond.. I think it permissible to quote an exchange of letters from Donald Goergen to Arabinda and his reply regarding Teilhard de Chardin, for the brilliance of their thought. Narad has dropped me a note inquiring about your article on Teilhard, Aurobindo, and Evolution. I apologize for my negligence in responding. I believe the article arrived last April, a busy time at the end of our semester, and for some reason I set it aside after reading it. Your handwriting is not as easy to read, and so I am not sure if there were any specific questions which you may have had, but I certainly appreciated the article and your sending it on to me. Let me make a few more specific comments, knowing one could go on at much greater length. 1. I don’t have any particular qualms about your interpretation of Teilhard. However, I do not judge him to be so far removed from more traditional interpretations in his understanding of Paul as you suggest. You refer to Bultmann, Schweitzer, and Knox. The first two are Protestant and do have less of a cosmic sense. But I think there are more cosmic readings of Paul, especially among some of the Fathers like Origen and others in the early Church. Certainly Teilhard has an evolutionary reading that one would not find in others, but I do not think there is such a wide divergence as you suggest on p. 24 — perhaps because there can be such a wide divergence within Christianity itself, as among the philosophies of India. So I think Teilhard picks up a sense of something in Paul that many commentators miss, but not all, for in Paul all of creation is groaning (Romans) and God through Christ becomes all in all (1 Cor 15). 2. On p. 25 you queried about “whether Teilhard studied Indian thought with close attention.” Unfortunately he did not. In looking back, we can say unfortunately. At the time I suppose it was not what was of as much interest, even though he spent so much time in China. But he did not delve into Asian religious thought at any depth, so he certainly lacked an appreciation of it as well as knowledge. I believe it was Ursula King who wrote a book on Teilhard and Eastern mysticism and acknowledges such. 3. Just as there is the tendency in the West to equate Hinduism or Indian thought with Shankara, so there can be the tendency to try to come to a uniform understanding of Christianity in the East. But both are more pluralistic as you know. Most in the West may not know of Ramanuja. Thus Teilhard is working with a limited understanding of the East. 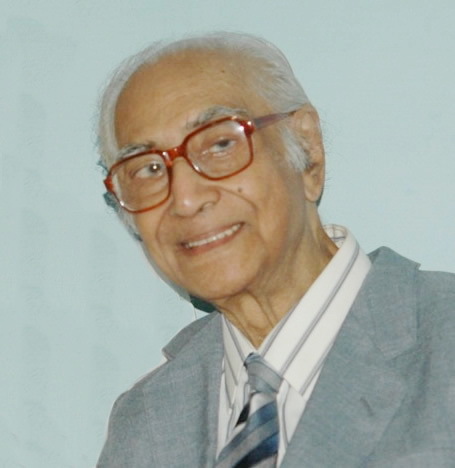 Nevertheless, he probably still, as a Christian, at that time, before the Second Vatican Council, with limited freedom, would have said the same about his Christian view of evolution, that Christianity offered something not found in the East — even if he had recognized a transcendent God in Indian thought — but he may have generalized less, or been more appreciative. 4. I myself would admit and have that Aurobindo develops at much greater depth the reality of spiritual evolution. Although Teilhard extrapolates, and sees all as converging in and through Christ, he does not go into the spiritual dimension to the same degree. But here Indian philosophy is at an advantage since its great strength is its refinement of spirit. Teilhard would see heaven and earth coming together in the Christ event, and probably not see anything comparable in Indian thought to that, the avatar not being an equivalent analogy. Thus Teilhard, even if more knowledgeable than he was about the East, would still have emphasized I believe a supremacy to Christ — as pre-existent, as evolver and immanent, and as Omega or destiny. Here we come not so much to Teilhard and Aurobindo, but simply to the dialogue between Christianity and the East. Christianity would see something unique in the Incarnation and in the mystery of Golgotha that probably would make Indian thought appear more Pelagian, even if Aurobindo would not be due to his emphasis on the descending Supermind as grace. I would agree that Teilhard does not have a counterpart to the Supermind, but the question would be for Christianity what the correlation if any might be between the Holy Spirit and Supermind, realising that they are not simply exchangeable. 5. The topic of high morality and spirituality is one that intrigues me since reading before Aurobindo’s own article (which I believe you gave me years ago) on Christianity. And I recall Amal Kiran once saying to me that he thought of Jesus as perhaps an unsurpassed moral teacher but not spiritually so profound. That would merit a wonderful conversation if our paths were to cross again. I do not find it offensive, but there is probably more to the matter than that alone. Aurobindo represents a rather distinct and highly developed spiritual philosophy from India about which many remain still unfamiliar. I frequently refer to him in talks and lectures. But I am not prepared to say that he has superseded Christianity. And thus I would be more of an Aurobindonian Christian than a Christian Aurobindonian, to use words I believe that Amal Kiran used in his correspondence with Bede Griffiths. 6. That may be enough for now. I agree that Teilhard’s noosphere is not yet Aurobindo’s Supermind. The question may be whether there are any resemblances in function between Supermind and Christianity’s Christ and Holy Spirit. Let me thank you profusely, Arabinda, for being so kind and attentive to send me the copy of the issue, and let me apologize once again for my neglect. If there was something further you wished, I may not have read it correctly from your handwriting, but do feel free to write and inquire further. I always enjoy hearing from you. Thank you for your letter of December 20, 2009. I am replying to it after a whole year, for which I am sorry. I couldn’t do it earlier because of health reasons. Nevertheless I am working, writing and giving classes, though at a slower pace. I don’t want to deal with all the points you have mentioned in your very clearly written letter. My main problem is not whether Teilhard de Chardin is right or not. Very clearly he is an evolutionist but I have always read that the biblical theory about eh world is that it come into being by fiat of the will of God. It is a theory of special creation, “Let there be so and so” and that came into existence. Can this doctrine of creation be reconciled with an evolutionary view of the world? I myself believe that Teilhard had a very clear vision and idea of the world and human destiny which I think is splendid and true. He himself grants that the passages that he has culled from Paul and John do not obviously support an evolutionary view. You say that Paul had a clear cosmic vision. Does it necessarily imply that the cosmos is evolutionary? Since my school days I have been very interested in St. Paul and his career. The way that he suffered to propagate the message of the Lord whose voice he was fortunate enough to hear, how Saul became Paul. As regards comparison with Sri Aurobindo’s evolutionary view and that of Teilhard, it seems to me that the latter falls short of the clear supramental view of evolution. Teilhard stops at the Noosphere and if he had a glimpse of anything beyond the Noosphere is can be granted that where he was or at least used to be from time to time on a high level of the Noosphere because according to Sri Aurobindo each level of consciousness have several levels. Teilhard’s “Hymn of the Universe” is to me the expression of a very high level of experience of the spiritual kind. So my problem is not Teilhard so much as the theory of the special creation and the doctrine of evolution. Is there any chance of your coming to India? Jadavpur University, one of the better ones in Bengal, has a Centre for Sri Aurobindo’s Studies which is doing good work. I would very much like that you should give a course of lectures on Sri Aurobindo and Teilhard de Chardin. The time of your visit can be arranged according to your convenience. When you are in Calcutta you would be a guest of the Center. I hope you are keeping well and reading and writing as usual. The “Flame of Love” is a wonderful book. Thank you for it. In an issue of Gavesana Donald Goergen mentions meeting Sri Aurobindo twice in recent years, once at Park Guest House and once in Madras at the airport. Arabinda also told me that he went into such a deep trance in Sri Aurobindo’s room that they had to physically take him out after some time. On another occasion Arabinda told me that he wrote to Sri Aurobindo many years ago and asked him if he could join the Ashram permanently. Sri Aurobindo replied (and again, I can only paraphrase) ‘I have spoken with Mother and we both feel that you should see a bit more of the world’. Sixteen years would pass before he could come and settle in the Ashram! The recent years were those in which I had the most powerful experiences with Arindam but also the sharing of the most warm and human moments. He would allow me to bring friends from time to time and I know that for them those evenings were filled with light. 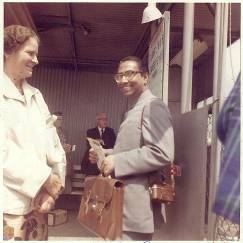 One day he said to me, “I want to take some photos with you, but only on one condition, you must wear a Bengali dhoti and I will wear a business suit!” I include some of these delightful photos at the end of this article. One could ask Arabinda anything. I spoke to him on the current state of the Middle East, on the possibility of a nuclear conflagration with Iran and Israel, and the effect of the Supramental Force on the world today. His answers were always clear and concise. He stressed more than once that Mother’s statement that there would be no seventh pralaya was absolutely true although there would continue to be local conflicts around the world. Arindam came to me before midnight and took me to a house by the sea. He told me of many places in the world, mentioning cities by name, where one could have the experience of the sea. He led me into a house (I remember a lady was walking or standing off to the right) in a fairly large room with an enclosed verandah overlooking the ocean. He then took me down a short flight of stairs to another room. I somehow remember sitting on a ledge where I was at eye level with him as he stood before me. Then I saw that he had a ripe green grape between his fingers. He very softly touched my left eye (at this point I had closed my eyes) with the grape, then my right, and then the centre between my eyes. At this point I must have opening my eyes for I saw him very gently place the grape between my lips, after which I chewed it and swallowed it. A very partial explanation has come to me. The ocean represents the possibility of the expansion of my consciousness, the grape the Divine Ananda which he was giving me. 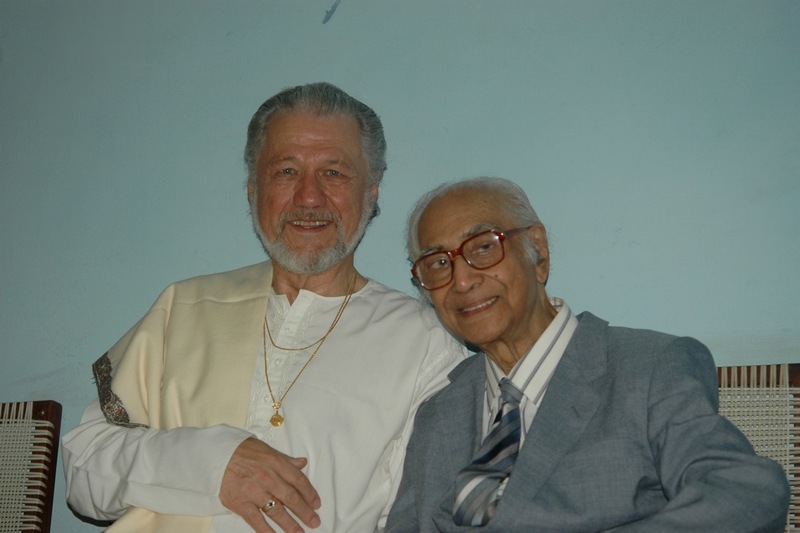 In the very early days when we first met, Arindam taught me some songs to Sri Aurobindo. 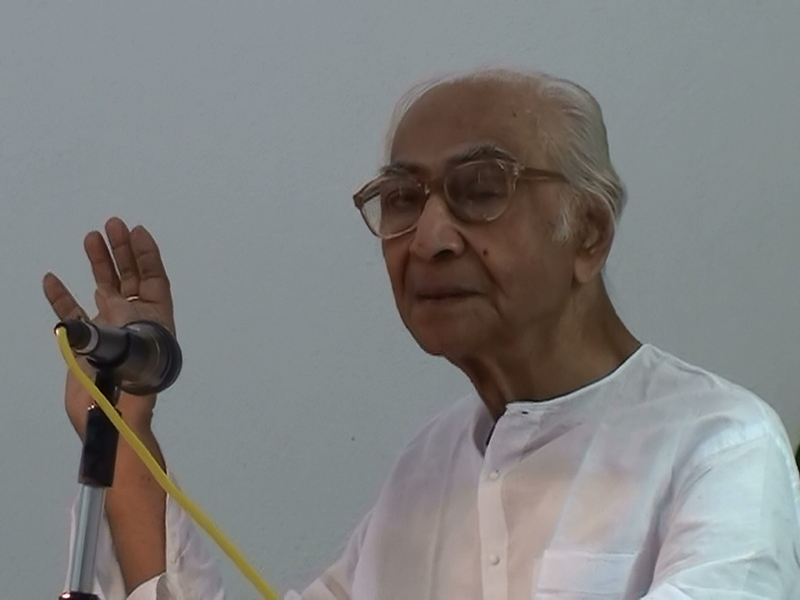 Although one of the pages on which he wrote a song had been eaten by termites in Auroville, I have preserved it and hope that soon a Sanskrit scholar will help me with the words. Here is Arindam’s English translation. universe, Lord Sri Aurobindo glories. When Arabinda asked me to help him write a CV we had a good laugh when I mentioned that he had forgotten to add that he was the Spalding Lecturer at Durham University! 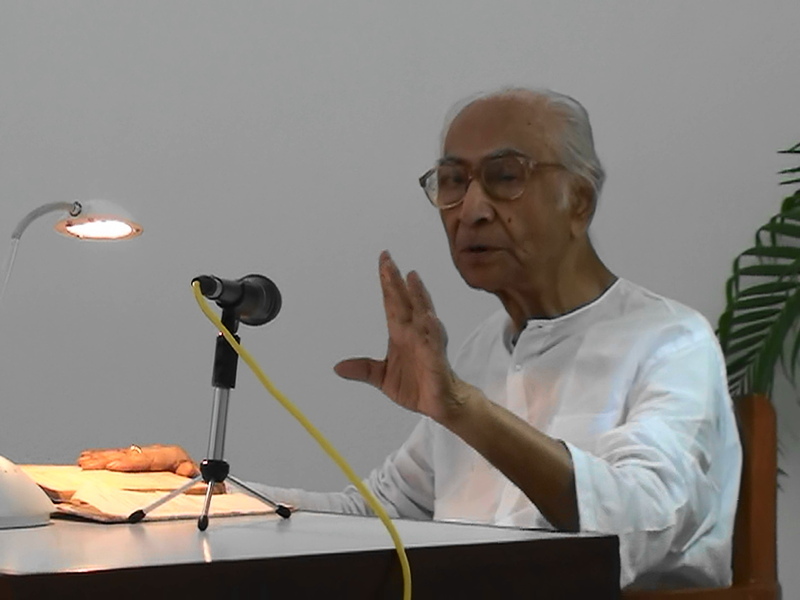 Arabinda Basu at age 92, is a resident of the Sri Aurobindo Ashram in Puducherry, India where he is Professor of Philosophy and Editor of the Journal Gavesana. I conclude with two very recent experiences with Arabinda, one when I was alone with him and one when I brought a friend. Even though Arabinda’s body was becoming frail and I would have to hold him firmly when we walked to the front door to get an auto rickshaw, his mind was filled with light and this radiance was clearly seen by many. 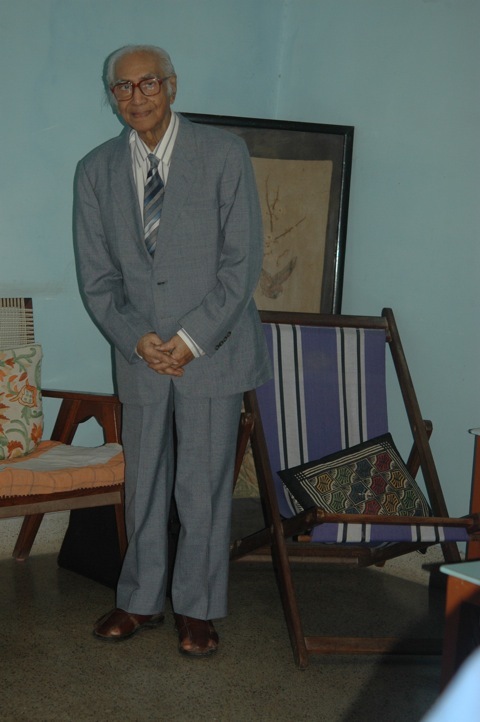 One evening we were in his study and he began speaking of Sri Aurobindo. He said that Sri Aurobindo was very close. When I asked him about Mother, he laughed and said, “I don’t know exactly where She is because She is everywhere!” As he spoke of Sri Aurobindo’s yoga there came into the room a peace so concrete and palpable that it filled every space and filled me with a great silence. Then I felt Sri Aurobindo’s Presence and Arabinda said softly to me, “He is here.” I don’t know how long the darshan continued but the silence was Physical as was the Peace. I have had the blessing more than once of kneeling before Sri Aurobindo in the subtle physical plane where He resides and I knew without question the moment He entered the room. The second time, most recently, when I brought my friend, Arabinda spoke for two hours on Sri Aurobindo. His words were like a golden light entering me and suddenly it happened again. Everything in the room became still and the Peace and Silence descended. Arabinda turned to my friend and asked him what he felt. We were both speechless. Then Arabinda said, “He is here.” We all sat and bathed in the glow of His Presence and then Arabinda said, jokingly, “Whenever we speak about Sri Aurobindo and His yoga, he has to come! And so I close my tribute to this exemplary disciple of Sri Aurobindo and the Mother, recognized, sadly, by too few as a great yogi. I will always remember him with humility and gratitude for all he has done to bring me closer to Them. And glimpsed the presence of the One in all. This is brilliant & heart scratching. Nature might stand up and say here was a Man. Thanks for sharing. 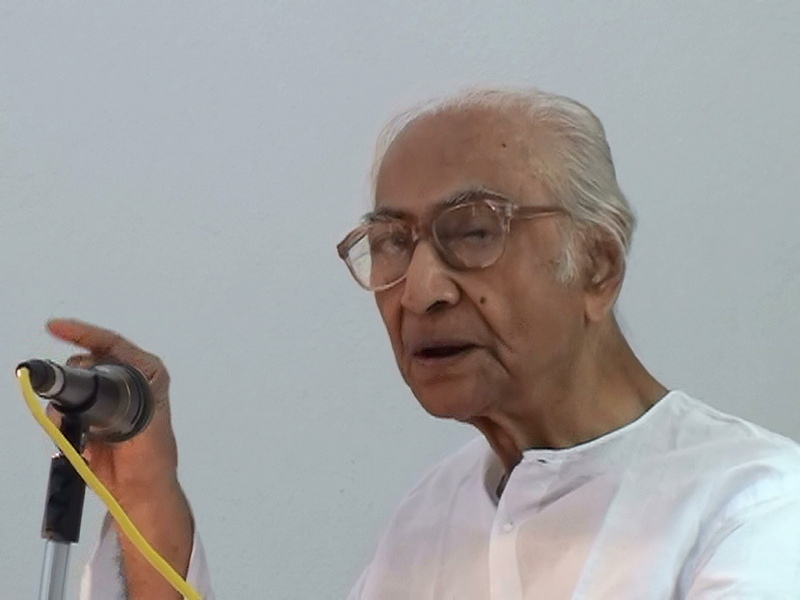 thank you for posting this tribute from Narad about Prof.Arabinda Basu. very nice! It is now more than 40 yrs. that a very trivial incident has lingered in the back-drop of my memory with our great professor. He along with his wife had to urgently go for some conference for the day. They were unable to take their young son with them. So they went to the neighbors to keep their son there. Prof – We were a little concerned, because the neighbor’s daughter spoke only French and my son only spoke English. So in the evening when we returned , I asked my son How it went. Son – Oh simply wonderful ! She spoke French, I spoke English and we went along perfect ! This incident by itself is very trivial but we have to give a far more deeper understanding in the psychology and chemistry of children. general i want to put it here. Hearing from Naradaji is really wonderful. Taking any initiative to improve our lives is a great endeavor, and will surely bring wonderful results in the lives of anyone who takes it up. Normally we take up this effort when we are ready to move to a next level of achievement, success, happiness, knowledge, etc. This effort is normally sporadic and intermittent. There are however a very few individuals who completely dedicate their lives to this effort of ascension. Those who make their own growth and evolution the central focus of their lives are said to be practicing life long evolution, or yoga, the Indian term for union with all. One form of yoga proposed by the Indian author and sage Sri Aurobindo is an integral yoga, where all aspects of life become an opportunity for growth, development, and evolution. Wonderful! Thanks for sharing.More people should come out with their experiences. Reblogged this on The Mother's Lasso. 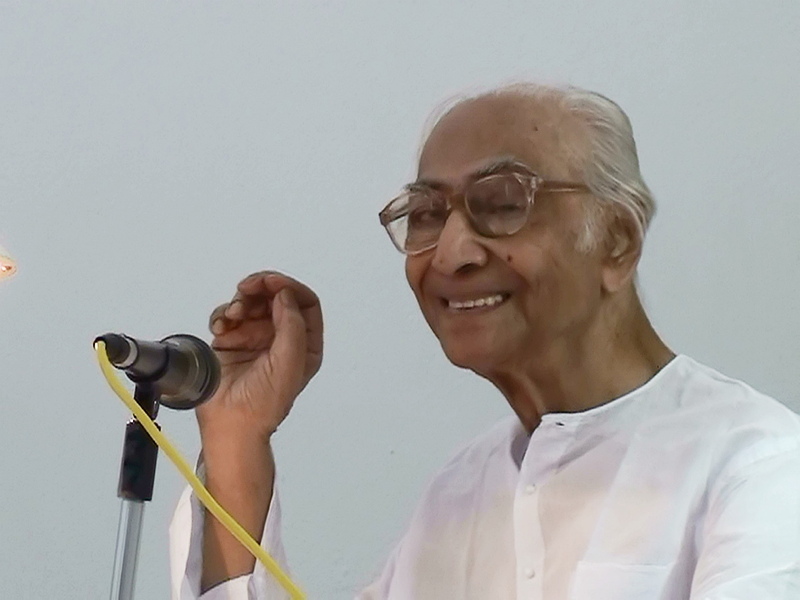 I had the good fortune of listening to his talk on certain aspects of Integral Yoga and Sri Aurobindo in SACAR symposium.It is unforgettable.A great Scholar and great Yogi.